Once upon a time, I planned ahead and decorated so nicely for changes in seasons. 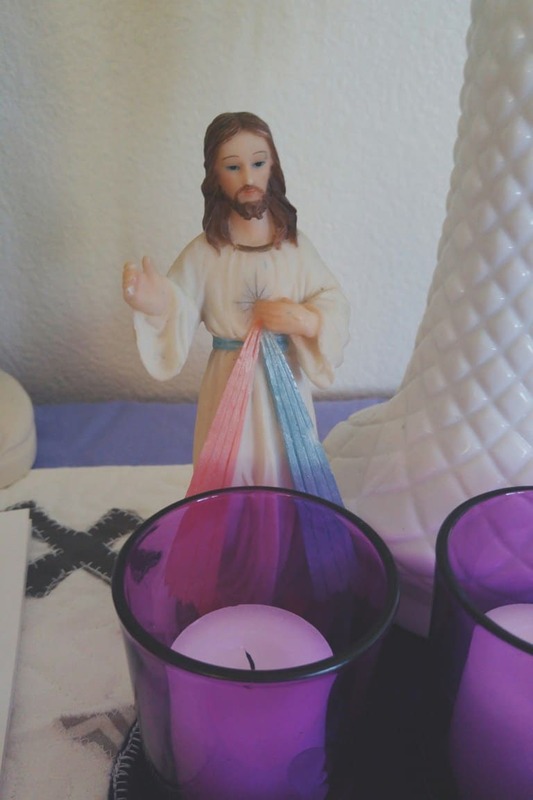 Now, it feels more like a scramble, but even now as we are in Holy Week, you and I can still create a liturgically-themed space in our homes. Yes, even you who swears she does not have a crafty bone in her body. First, remember that our focus is on the sacrifice of Christ and his Resurrection. Second, Martha Stewart we are not. With that cleared up, I start with a prayer space. The idea is for Holy Week to be simple, meaningful, and prayerful. It is a perfect week to focus on the Gospel stories, the Old Testament history and lamentations, and quiet, personal prayer. This is why a special prayer space is meaningful and my first priority over other things. We have a little table my husband built, and it placed it in our family room with our couches. This is where we gather every night as a family to pray, and it is my starting and focal point for decorating. You can be as elaborate or simple as you want! The basics: a crucifix. Simple as that. 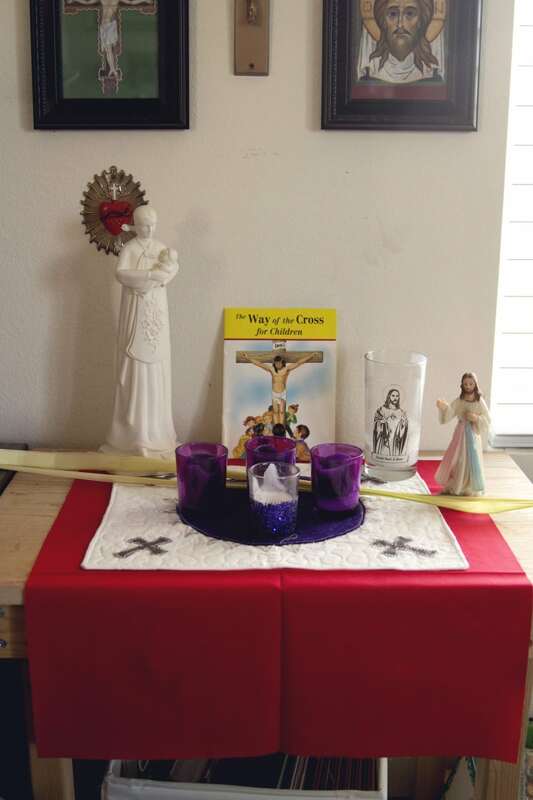 Extras: statues, candles, cloths, other holy images. What I have is gathered from around the house. This morning I grabbed a red piece of fabric from my quilting stash. See how simple? I didn’t even iron it, because I’m lazy and last-minute. Ironing would nicer. 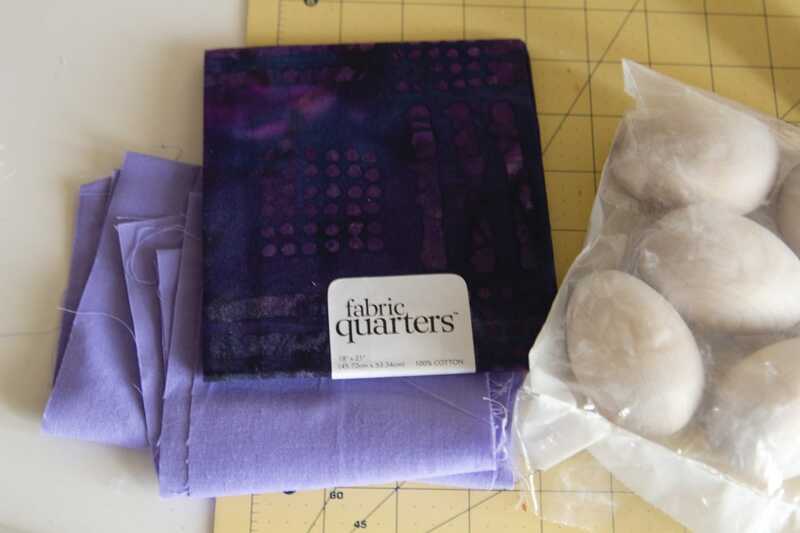 If you have time to swing by a craft store (not Michael’s, since they don’t carry fabric), you can purchase a fat quarter of fabric for your table. They look like this at JoAnn’s. Buy a few! White for Holy Thursday and Easter, red for Good Friday, and plan ahead for ordinary time and get green, if you like. You do not have to sew anything. 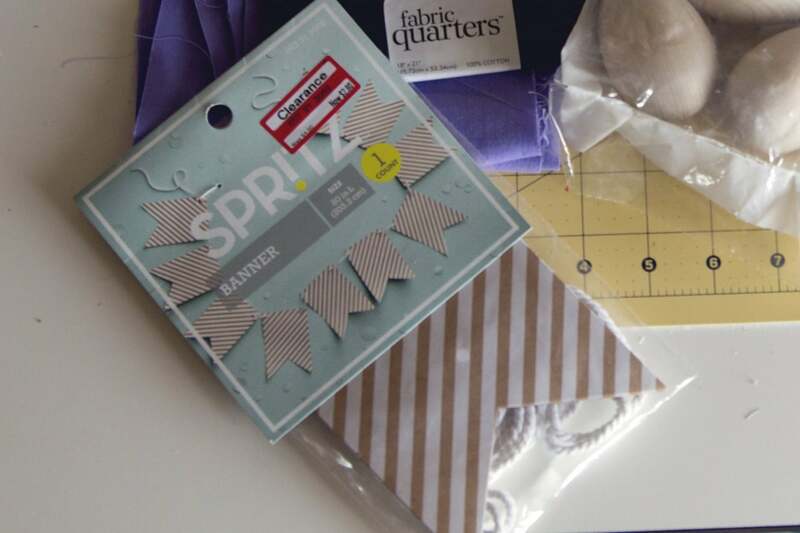 Take it up a notch and sew the edges if you want a more finished look (and if you have time). We are still using purple votives this week. It will be so beautiful to bring out a white pillar for Easter! I am going to use a jar scented candle, because I already have it, and wrap it in burlap and lace. For Holy Week, our palms adorn the table. On Good Friday, all we will have out will be the red cloth, a rustic (hand-tied) cross made from branches from the yard, and the crucifix on the wall. I set out this children’s Way of the Cross for us to read and pray with each day, especially on Good Friday. For Easter, the red table cloth is replaced by white, the purple votives disappear, and flowers grace my table. Fresh or silk or paper, it does not matter! Adding the color and sign of life makes the table so joyful! I also plan on painting “alleluia” onto this paper banner I grabbed from the clearance section at Target. It will hang across our mantle. Now you’ve gathered a few ideas for a Holy Week prayer space…what next? The Triduum. Oh, how I love the Triduum. It’s been years since I was able to celebrate from Holy Thursday all the way through the Easter Vigil (the vigil is just so hard on my kids! )…but I do bring the family to Veneration of the Cross on Good Friday. This year, we are going to also celebrate the Holy Thursday Mass! My son will be in the children’s choir, and since he also makes his First Communion this year, I think it will be a very special time. Truly, the best way to live this week is in prayer and celebrating the liturgy at church! 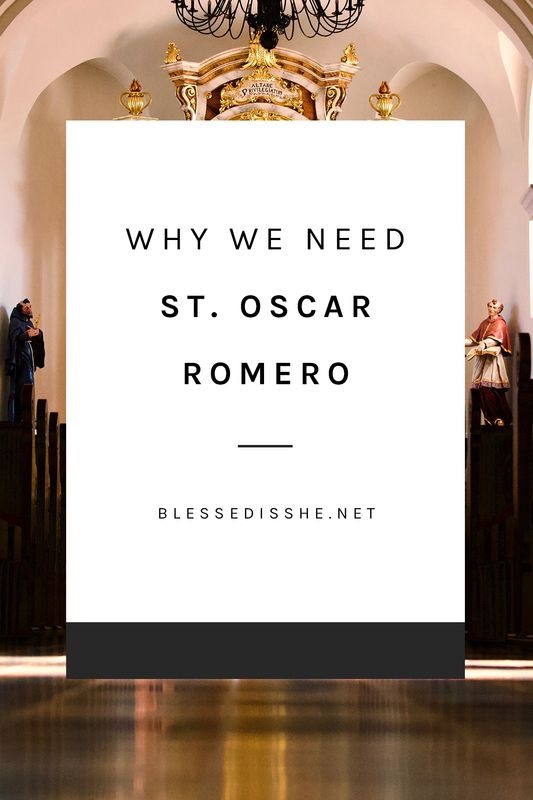 Whatever else you choose to do, do it because it helps you enter more deeply into your devotion to our Risen Jesus, and not because any blogger or Pinterest pin made you feel like you had to. 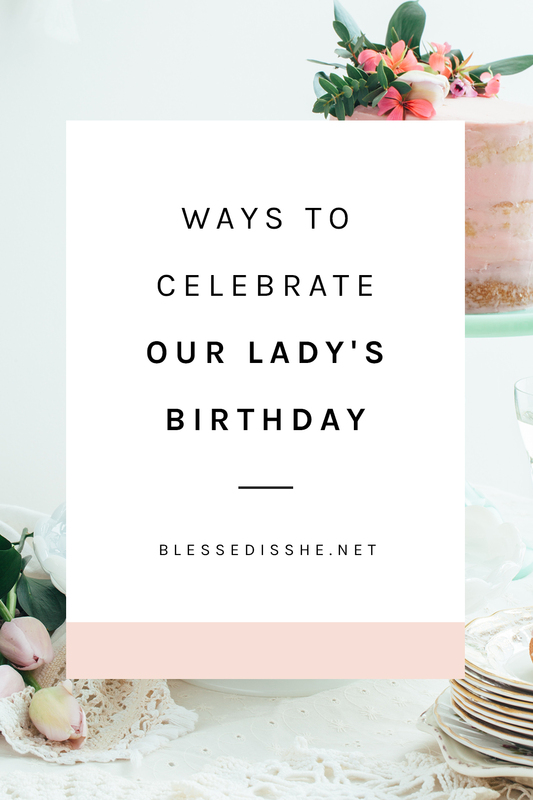 One year, I went all-out with a themed meal for Holy Thursday…but now, I skip it. I literally do not have time for all the things. 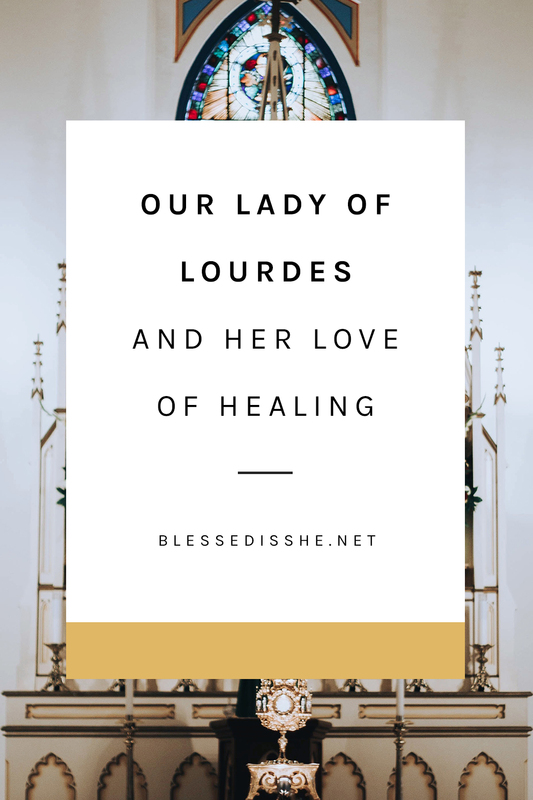 Instead, I choose to focus on the story, the prayers, and the liturgy with my family. We do enjoy baking hot cross buns together on Good Friday. Beyond that, our time is spent decorating eggs, baking for Easter (if I’m hosting), and enjoying each others company. One neat recipe that seems simple–and I’ve always wanted to give it a try–is for Easter Story Cookies. These come with a story to tell with your children as you prepare and bake, for another way to teach and help them appreciate what Jesus did for us. These are great suggestions for a beginner (me)!! Thank you!